Bakery On Main came from humble beginnings in the small bakery of a natural foods market on Main Street in Glastonbury and expanded to what is now a nationwide business distributing to the U.S., Mexico, Canada, and Europe. Michael Smulders, president and founder of Bakery On Main, took action to cater to his customers suffering from food allergies or needing to accommodate other special dietary limitations. His mission was to make delicious gluten-free options readily available. Their products include gluten-free granola, granola bars, and oatmeal. “Back 10 to 12 years, products made for people with food allergies or intolerances tasted like cardboard. We wanted to break that stereotype,” said office manager, Deirdre Stolte. Bakery On Main supports a number of organizations such as Pierce’s Pantry, Hartford Foodshare, Gluten Intolerance Group, and more. “It is expensive enough to purchase health food items when you are stable. We want everyone to be able to have healthy food, especially those with dietary restrictions,” Stolte stated. Recently, Bakery On Main made a generous donation to Goodwin’s Transitions Food Pantry in an effort to give back. The pantry strives to remove hunger as a concern for our Goodwin family by soliciting, collecting, and distributing food to those in need. “We are part of the East Hartford community. When people fall on hard times and need help getting food on the table, it is our responsibility to help. We are happy to do whatever we can,” Smulders stated. Last year alone, Bakery On Main donated over 13,00 pounds of food to FoodShare. The partnership and relationship between Goodwin College and Bakery On Main has only just begun. Generous tuition assistance is now offered at Bakery On Main to all employees who enter into Goodwin’s Certified Production Technician Program. “We really want to see our employees excel. We’re looking forward to growing our company and having a certified work force. By supporting our employees, they see we are invested in them and we hope they stay invested in us,” Stolte explained. Ten employees are set to start the manufacturing program in the spring. “Bakery On Main opened our eyes to different manufacturing opportunities in the food industry”, said Al Pucino, Manufacturing Management Director for the Department of Social Science, Business, and Education. Bakery On Main generously offered to put together a box of products to bring to the food pantry whenever needed. “Their enthusiasm has been amazing,” said Guy LaBella, Goodwin College Assistant Director of College Relations. Visit http://bakeryonmain.com/ to check out their products, story, mission, blog, upcoming events, and more. If you would like to learn more about Transitions Food Pantry and how you can help, please contact Mike Rotondo atMRotondo@goodwin.edu. With the campus constantly expanding, Goodwin College is implementing two new and environmentally friendly transportation opportunities to help students and employees get where they need. The College is partnering with UHaulCarShare for the first initiative, a vehicle-rental program accessible from Riverside Drive 24 hours a day. For the second, Goodwin is launching a bike share program which allows free access to students to the 15 bicycles now on campus. Goodwin owns properties throughout East Hartford, extending from the main campus on Riverside Drive to the area neighborhood and to points all along Main Street. Through the car and bike share programs, all areas of the campus will be accessible. The Car Share program has begun operating on campus. UHaul has provided a Nissan Cube to Goodwin, which is parked in front of the main building next to the electronic car charging stations. “Offering the UHaulCarShare Program is a valuable — and practical — way to make transportation available to those who need to get around our expanding campus. It’s a great benefit to the people we serve,” said Bryant Harrell, Goodwin College Vice President for Physical Facilities and IT. All Goodwin students, staff, and faculty members with a driver’s license and a credit card are eligible to use the service. For a reduced fee, participants will be able to use the car to complete errands and do other tasks where personal transportation is required. To use the service, participants must register online at www.uhaulcarshare.com. They will be asked to create a profile and photograph their driver’s licenses and themselves. Approval is a matter of minutes and managing reservations can be done directly from a smartphone. The fee for use is $4.95 per hour plus $0.49 per mile, with a maximum of $8.75 per hour. According to UHaul, the service effectively takes 20 personally-owned vehicles off the road, in turn removing parking congestion while reducing environmental impact. The Bike Share program is also up and running on campus. 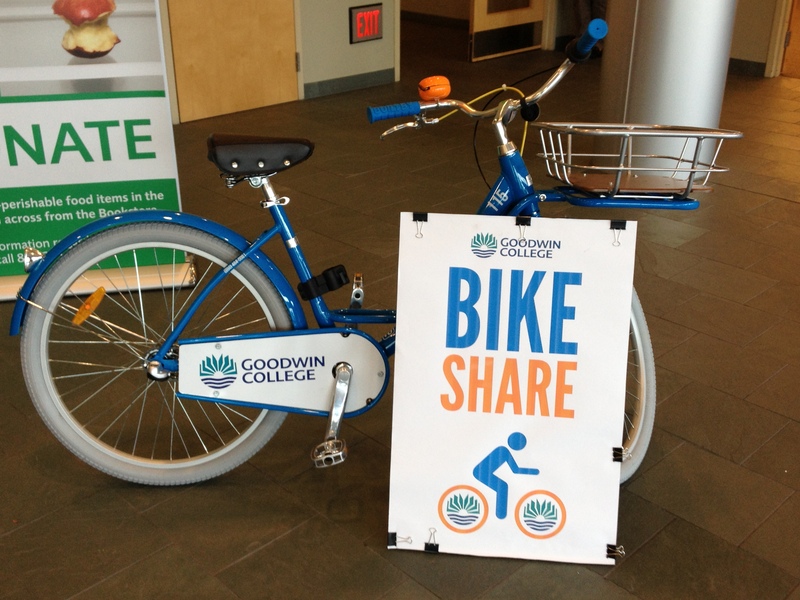 Goodwin has 15 bicycles available for use, providing a healthy alternative to driving from building to building throughout the College facilities in town. Bikes are available at three different locations: One Riverside in the main parking lot (next to the Car-Share), 403 Main Street, and 1137 Main Street. There is no charge for students, staff, faculty, and other members of the greater community to participate. Users must register online at http://sharedbike.com/company/goodwin/. After registration is approved, participants may go to claim a bike. A telephone number is displayed on the bike. After dialing the number, the user receives the combination password unlock to bike. They then have possession of the bicycle for up to 3 hours before it must be returned. For more information, email bike@goodwin.edu. From the golfers to the scholarship recipients, few Goodwin College events generate as much goodwill and fun as the annual golf tournament. This year’s event was certainly no exception, with over $100,000 raised to benefit students and help them excel. 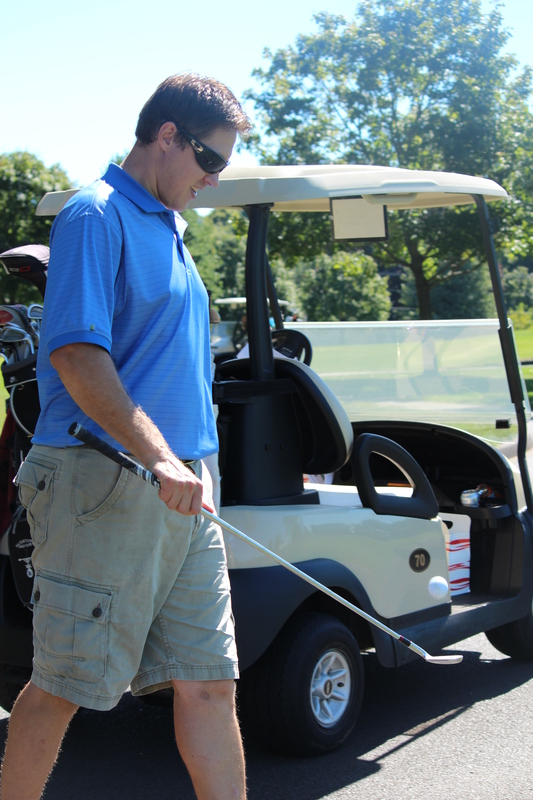 Michael Ekstrom, grandson of Augie & Ray’s owner Ernie Hutt, juggles a golf ball at the end of a club. Photo by Charissa Bass, Goodwin College. “This is the type of event that benefits everyone involved,” said Raymond Solomson Sr., a member of the Goodwin College Board of Trustees and co-chair for the Gold Tournament. “The golfers have a great day out on the course, the volunteers generate so much goodwill for the College, and our students receive scholarships that will help them achieve great things at Goodwin College and beyond. 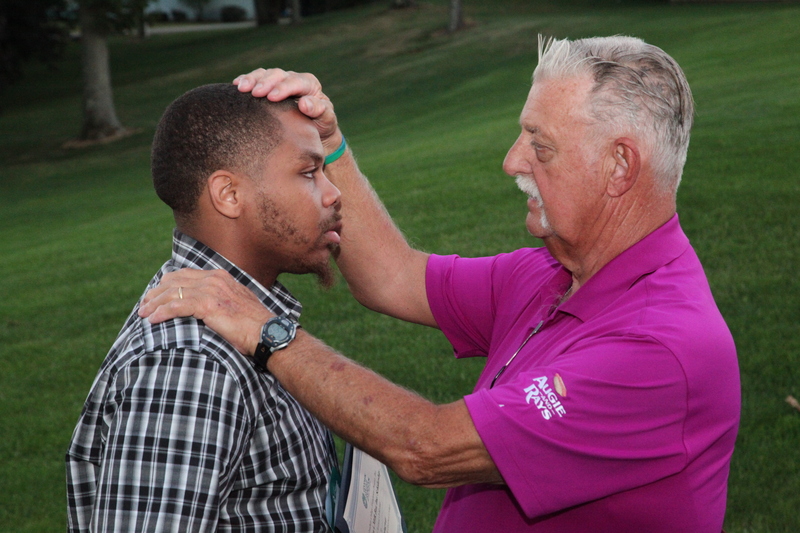 The 8th Annual Goodwin College Foundation Golf Tournament was a rousing success, held on Wednesday, September 18, at the Topstone Golf Course in South Windsor. A full field of players had a gorgeous day on the links, with a cloudless sky setting the backdrop for the competition. “I don’t know how we keep getting away with days like this,” said Goodwin College President Mark Scheinberg as he opened the festivities. The winning foursome – Gene DeJohm, Ben DeJohn, Jim Tallberg, and Frank Morse – flanked by Golf Tournament Co-Chair Raymond Solomson Sr, and College President Mark Scheinberg. Photo courtesy of Muldoon Photography. The tournament is the largest annual fundraiser for the Goodwin College Foundation. Foursomes of golfers play 18 holes, with the winning team receiving a trophy engraved with the names of all the past champions. 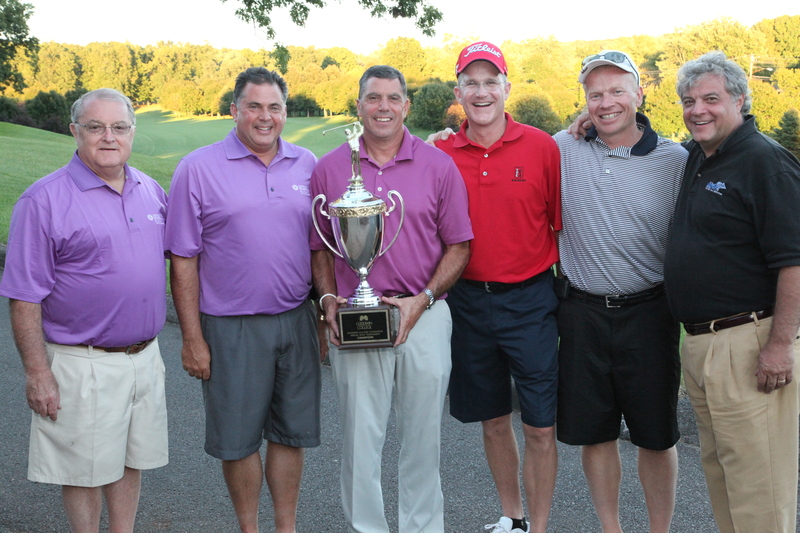 There where repeat champs this year, with the group of Gene DeJohn, Ben DeJohn, Jim Tallberg, and Frank Morse victorious. Gene DeJohn is the husband of Goodwin alum and Board of Trustee member Merilee DeJohn. Following the tournament, the College held a banquet at Topstone for all the participants, as well as a handful of students receiving scholarships through the Goodwin College Foundation. Nursing students Regina Giudice and Diana Hamilton were awarded respective $4,000 Goodwin College Foundation Endowed Scholarships. Business student Michael Hemingway received the Augie & Ray’s Milk Bar Scholarship, which is worth $1,000. For more photos of the Golf Tournament, please visit our Flickr album. Michael Hemingway, winner of the Augie & Ray’s scholarship, gets a pat and advice from restaurant owner and presenter Ernie Hutt. Photo courtesy of Muldoon Photography. Pratt & Whitney, Goodwin College, and the East Hartford Board of Education are partnering to enhance the front landscaping of Hockanum Elementary School as part of the Green Apple Day of Service, a global effort that gives parents, teachers, students, companies, and local organizations the opportunity to transform schools into healthy, safe, and productive learning environments through local service projects. On Saturday, September 28, from 9 a.m. to 12 p.m., more than 30 Pratt & Whitney volunteers will use Goodwin College’s landscaping services and plantings to help arrange shrubs, as well as water, spread mulch, and do exterior painting projects at Hockanum Elementary, 191 Main St., East Hartford. Pratt & Whitney and its parent company, United Technologies Corp. (UTC), are hosting 15 Green Apple Day of Service projects around the world, including two in China, one in Singapore, and the Hockanum project in East Hartford. Two recent Goodwin College initiatives – the Community Garden and Riverside Farmers’ Market – have been crucial in supporting the common cause of Goodwin’s Transitions Food Pantry. The pantry strives to remove hunger as a concern for our Goodwin family by soliciting, collecting, and distributing food to those in need. A number of students find it difficult to meet their financial obligations and support a family while attending school. The Community Garden, founded in 2012, is dedicated to sharing the joy of gardening with our students, employees, and neighbors in East Hartford. The garden space includes 55 raised beds, a community tool chest, and sitting area. Roger Bousquet, an employee at Pratt and Whitney, uses his plot to plant and pick vegetables specifically for Goodwin’s Transitions Food Bank. The Riverside Farmers’ Market includes multiple vendors who sell fresh produce, herbs, cut flowers, sauces, and all natural shea butter products to the public every Tuesday from 3 to 6 p.m. through October. The market is also a participant in the Farmers’ Market Nutrition Program for WIC and SNAP recipients and senior citizens. Unity Farm, a participant in the market, donates a portion of their unsold vegetables to Transitions Food Bank. “I truly believe we should help people in need. I’d hope somebody would help me if I needed it,” said Kelly Jacobs, a member of Unity Farm. George Duhart, also a participant in the market and owner of George Gee’s All Purpose BBQ sauce, donated a portion of his sauces to the pantry. “What you sow you shall reap. People who aren’t willing to give find themselves in a state of destitution because they want to hold on to everything,” Duhart stated. Sandy Pearce, Goodwin’s Webmaster, has played a large part in organizing and maintaining the Community Garden and Riverside Farmers’ Market. Pearce brings the generous donations to the Food Bank and whatever is not needed at the time is shared with St. Rose’s Church in East Hartford. “When you give back to the community, you are a part of a positive change. It connects you with those in need. You are a part of improving their quality of life and empowering them to believe in a better future. It’s heartwarming to see the domino effect that giving back has on people,” Pearce said. Over 100 pounds of food have been donated since July. “Donations to the Transitions Food Pantry are critical in our effort to alleviate hunger among the members of our Goodwin College Community who are in need,” said Mike Rotondo, Transitions Food Pantry Assistant Director and Associate Professor and Co-Director for the Business Administration Program. Goodwin is determined to serve our non-traditional students in as many ways possible. The College is continuously making positives strides to better both the Goodwin and East Hartford community. If you would like to learn more about the Community Garden and Riverside Farmers’ Market, please contact Sandy Pearce at SPearce@goodwin.edu. If you would like to learn more about Transitions Food Pantry and how you can help, please contact Mike Rotondo at MRotondo@goodwin.edu. While Goodwin College continues its mission to bring American-style education to Ghana, the West African nation brought some of its top educators directly to East Hartford last week. On Friday, a delegation including 26 Ghanaian principals toured Connecticut, studying the state’s education system at all different levels. The visit provided a unique opportunity for the College and the educators to learn from one another, a relationship that benefits Goodwin as well as Ghana. The delegation arrived at Goodwin on Thursday, September 5. Though the visit was brief, both parties acknowledged a connection and shared sense of mission and purpose. “We are kindred spirits with you in ways that would not be clear if you hadn’t been here,” said Goodwin President Mark Scheinberg, addressing the principals. 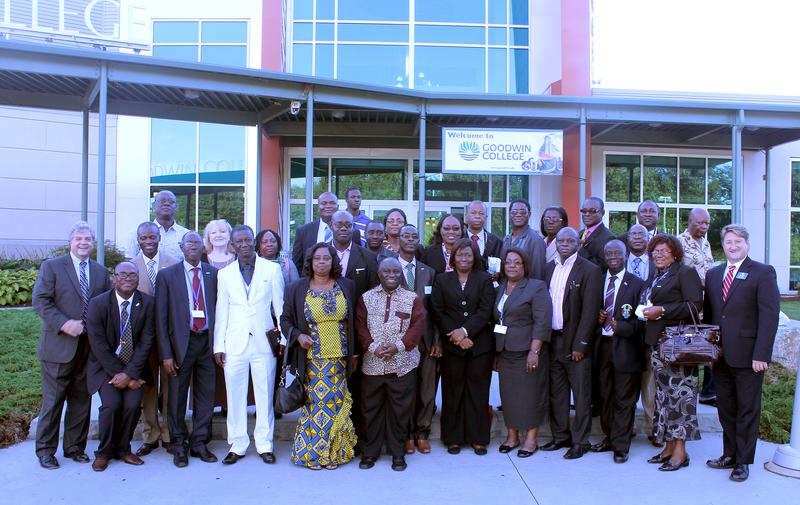 Goodwin officials pose with the Ghanaian delegation of principals outside the College’s main entrance. Scheinberg explained the reasons to connect with the delegation. East Hartford has one of the largest populations of Ghanaians immigrants in the state and many Goodwin students are of the country’s descent. As a result, Scheinberg said, the College has a natural affinity for the Ghanaian people. Moreover, Goodwin is embarking on a challenge to open Goodwin College Ghana in the country’s capital city of Accra. On track to open on October 30, Goodwin College Ghana is a newly renovated learning space designed to help Ghanaian students attend online courses in pursuit of a bachelor’s degree in Business Administration. Goodwin is providing the facilities, equipment, personnel, and guidance to help make the program a success, offering the same quality nonprofit educational experience as American students in the same program. Goodwin administrators, including Scheinberg, have traveled to Accra as plans have unfolded on the learning center. While the process is daunting, Scheinberg told the delegates that nothing is ever achieved without taking a chance. He added that at the outset, Goodwin thought it was doing something just for the Ghanaian students, but that eyes have been opened to a greater purpose. “What we’re finding is that it is terribly important to us,” Scheinberg said. The principals hailed from all over Ghana, a nation of roughly 24 million people. Whether representing urban or rural schools, the educators were eager to see American education in action. Goodwin’s purpose seemed to resonate with the principals. Mohammed K. Ackonu, the head of a school in Ghana’s Central Region, said that the delegation came on the trip to “have a feel of American life.” By doing so, the principals could return with ideas on how education can help Ghanaians to overcome poverty and create new opportunities. 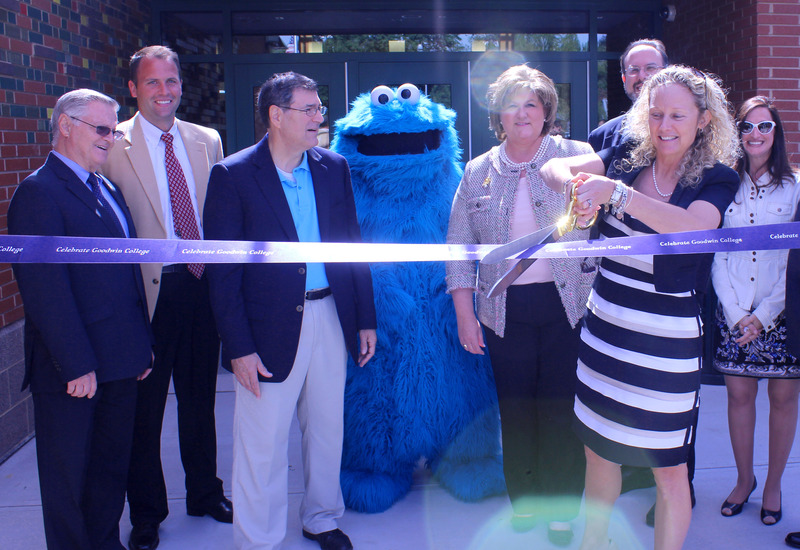 With some special guests from throughout the state and a good buddy from Sesame Street, Goodwin College cut the ribbon on its newest educational endeavor on Monday, September 9. Jenna Tenore, Director of the Goodwin College Early Childhood Magnet School, cuts the ribbon on the new school. From left to right: State Rep. Henry Genga, East Hartford School Superintendent Nathan Quesnel, State Senator Gary LeBeau, Cookie Monster, East Hartford Mayor Marcia Leclerc, State Education Commissioner Stefan Pryor, Tenore, and Goodwin College Director of Child Study Lori Blake. The Goodwin College Early Childhood Magnet School is now officially open. The school, which serves 240 children ages three to five in a unique learning environment, fills a tremendous need as the state seeks to provide more quality early childhood education to youngsters. The Commissioner was joined by Goodwin College administrators and local and state elected officials as they opened the school during a ceremony held on one of the two unique playgrounds on site. Cookie Monster made his way from Sesame Street to join the party, not only helping to cut the ribbon, but also to meet with many of the school children and inspire learning activities. As an interdistrict magnet school, the Early Childhood School welcomes children from throughout the Greater Hartford region. The school helps the state balance the number of urban and suburban learners, helping to satisfy the requirements of the landmark Sheff vs. O’Neill court decision to eliminate the de facto segregation occurring in Hartford public schools. Pryor emphasized that the College was not only helping satisfy the Sheff requirements, but was also providing a crucial component in school reform by creating quality learning opportunities and early intervention for young children. The school follows the Reggio Emilia model, which emphasizes learning through the senses and allowing children to explore learning. The concept requires strong relationships between children and adults as well as genuine sense of community where parents and guardians are very much involved. “We are hoping we are able to do something quite special here,” said Goodwin College President Mark Scheinberg. The College president thanked all the parties involved in the opening of the school and gave recognition to design firm Svigalls + Partners, whom Scheinberg called “artists as well as architects.” He also credited construction firm Fusco Corporation with completing the project not only to specifics, but also under budget. Jenna Tenore, Director of the Early Childhood School, said that the partnership between the new school and Goodwin College would provide an incredible program not just to the children, but to the Goodwin students who will be working with the classes and studying how an Reggio Emilia school works. Students in the Goodwin College Early Childhood Education and Child Study programs will be working with the school to create a mutually beneficial relationship. “We will also have the opportunity to influence the next generation of early childhood educators,” Tenore said. 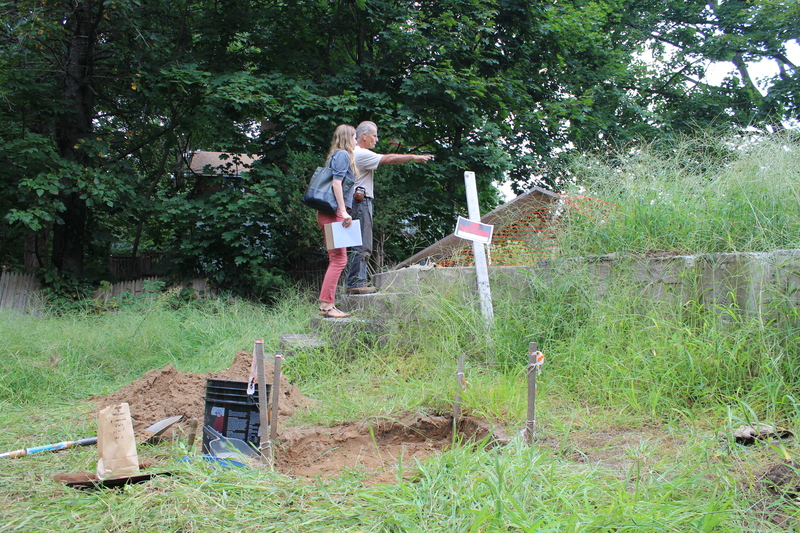 Stepping onto the scene of an archaeology dig is a mystery-filled, thought-provoking experience. Traveling back centuries in time and piecing together how humans used to live is an exciting challenge for people like Nicholas Bellantoni, Connecticut State Archaeologist who works for the University of Connecticut, the Connecticut State Museum of Natural History, and the Connecticut Archaeology Center. Bellantoni and his team of volunteers, including students, historians, preservationists, and members of the nonprofit Friends of the Office of State Archaeology, recognized the potential for uncovering early artifacts at 233 High Street, where Goodwin College purchased a piece of land on which a now-decrepit house was built years ago. Before developing the land and tearing out the house completely, Goodwin invited Bellantoni to excavate the land, recover artifacts from the past, and take steps to reconstruct the history of the house and the people who lived in it. “We’re interested in the anthropological aspect. We want to learn about human behavior. People threw garbage out the windows at that time. We can learn a lot about them from their garbage,” Bellantoni stated. Bellantoni explaining the reasons behind the dig. 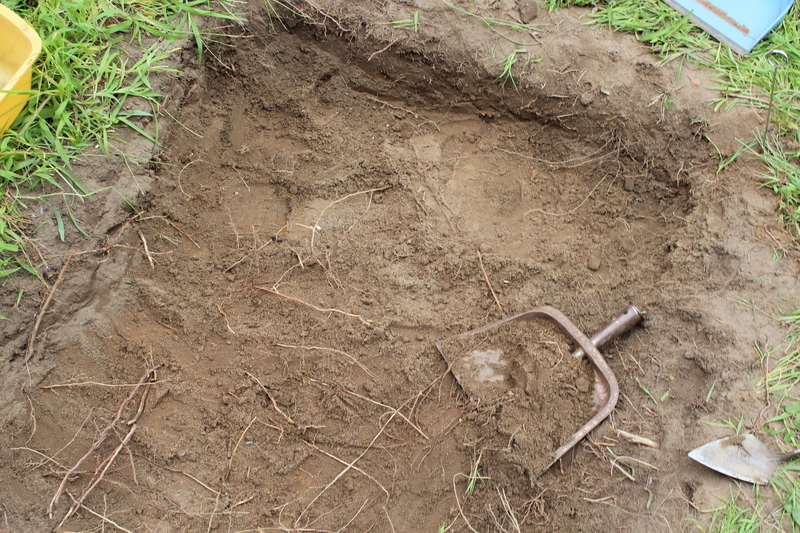 One-meter squares were gridded off and volunteers broke ground eagerly searching for artifacts. The squares allowed them to see the spatial distributions of all items. A tripod laser light beam shot measurements to see how deep they dug. The soil sequence is a vital factor in determining time periods. Above is a tripod laser beam used as a tool to measure depth. “We are able to see through a lens to different times because of the sub-soils and historic layers of deposits. We discovered that this land was once occupied by Native Americans before the colonial times,” Bellantoni explained. Volunteers recovered animal bones from turkey, lamb, and cattle. They found domestic ware such as bottles, blue and white pottery, and ceramics. They discovered clay marbles (predecessors to glass marbles), buttons, a bullet shell, a wooden dowel, and a slate pencil used for schoolwork. These inexpensive artifacts were typical of the post-Civil War era. 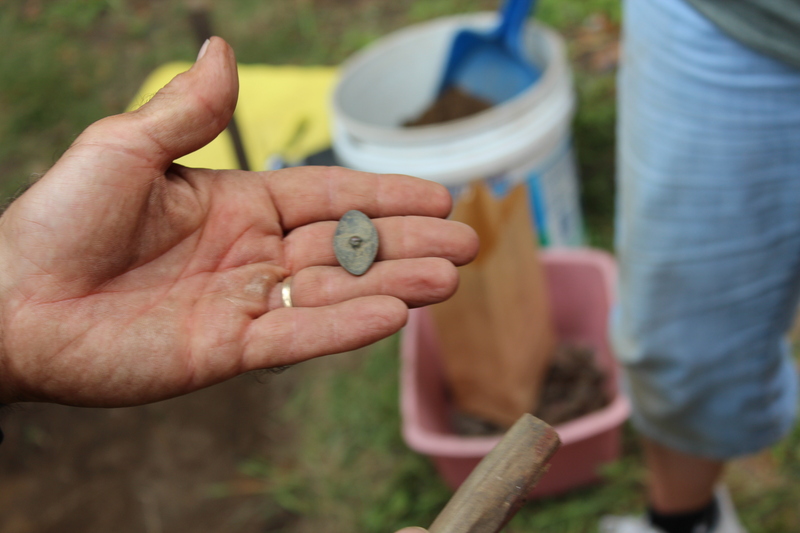 Volunteers found a button dating to the 17th century. Manchester native Ruthie Brown, a member of Friends of the Office of State Archaeology and East Hartford Historical Society Gravestone Group, and Fern Strong, East Hartford native, volunteered their time to support Bellantoni. “I was sorry to see the disintegration of the house as I passed by, and I was interested to find out what was here and learn about their economic situation,” Strong stated. The two volunteers worked together, digging for hidden items and hypothesizing about what this family was like. “I love being able to play in the dirt. I love to go after the mystery of it all,” Brown said. Respecting and preserving history is the common goal of all involved in the dig. All artifacts are bagged, brought to the lab, and examined further. 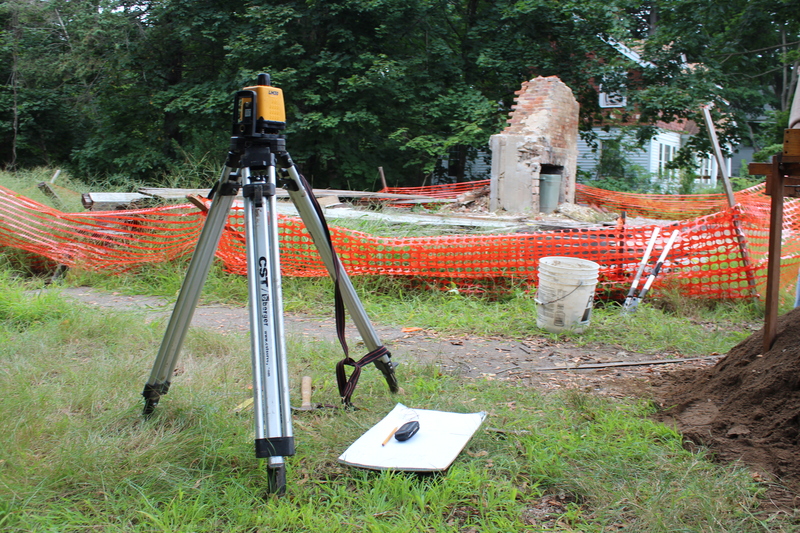 Goodwin will work with the University of Connecticut and the East Hartford Historical Society to determine the disposition of the unearthed items. Exciting learning and discovery opportunities await children and teachers alike as Goodwin College prepares to cut the ribbon on its new early childhood magnet school. On Monday, September 9, the College will officially open the Goodwin College Early Childhood Magnet School recently built at 29 Willowbrook Road. The College will hold a ceremony on the grounds at 11 a.m.
Cookie Monster will be making his way from Sesame Street to assist in the ribbon cutting on the new school. 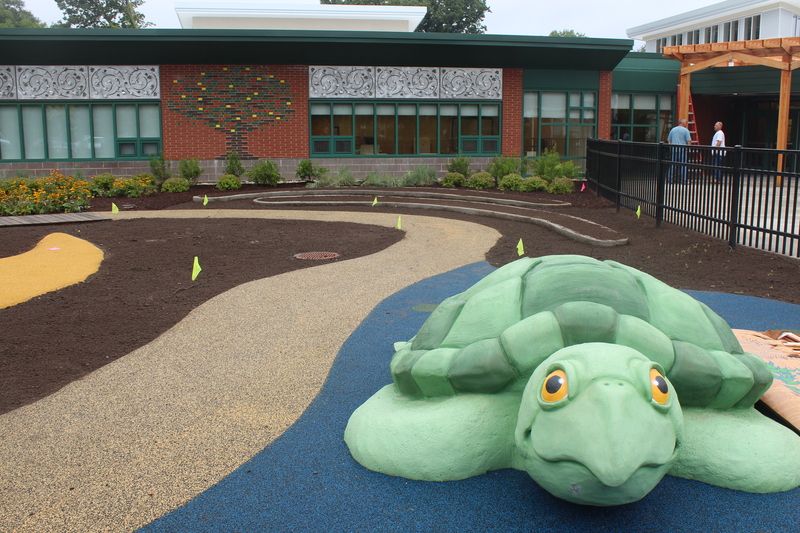 Turtle slides are just one of the many unique features of the new Goodwin College Early Childhood Magnet School. The school, designed and operating on the innovative Reggio Emilia model, is enrolling 240 total students in the prekindergarten and kindergarten programs. As an interdistrict magnet school, the school is welcoming children ages 3 to 5 from throughout the Greater Hartford region. A large percentage of students are from Hartford, with significant numbers of children also coming from East Hartford and surrounding suburbs. The College has reserved 15 percent of spots for the children of Goodwin students and employees. The school will open with 11 prekindergarten classes and four kindergarten classes. Two adults will staff every classroom, with a fully certified teacher and an assistant teacher. Additionally, students will receive lessons in art and music from certified teachers. The building also includes a full library and media center. A meet and greet for parents and children is scheduled for Tuesday, August 27. Kindergartners and half of the prekindergarten will begin at the new school on Wednesday, August 28. The other half of the prekindergarten will attend their first day on Thursday, August 29, along with the full kindergarten. On Friday, Aug 30, the full complement of students and teachers will attend school together. The official ribbon cutting will follow on the Monday after Labor Day, once the children and staff are a bit settled in their new school. Svigals + Partners Architects of New Haven designed the school, a one-story, 30,000 square-foot state-of-the-art early learning center built next door to the existing Willowbrook School. The building’s design and structure are very much part of the Reggio Emilia concept, which encourages nature, discovery, and exploration as major components of a child’s learning. The Reggio Emilia model encourages students to take direction over their learning and to make connections with other children and adults. Children learn through the senses and are provided with endless opportunities to express themselves. Students in Goodwin College’s Early Childhood Education and Child Study programs will be actively involved at the Magnet School. As a laboratory school, the Goodwin College students will observe and contribute to lessons. Goodwin College has hired Jenna Tenore, formerly the principal of the Wintonbury Early Childhood Magnet School in Bloomfield, as Director of the new school. The school is the second magnet school to open on the Goodwin College River Campus. In January, the College will open the permanent home of the Connecticut River Academy, its existing high school with an Environmental Science curriculum. Goodwin is partnering with LEARN, a Regional Educational Service Center, on both the Academy and the Early Childhood Magnet School. A third school, the new home of the Hartford Board of Education’s Pathways Academy of Technology and Design, is on track to open in April.